For some, only new will do. With fashionable finishes, trendy technology and a cruise ship’s worth of amenities — as well as auras untainted by previous occupants — freshly constructed apartments make the best homes for these buyers. But with an average sale price that exceeds $4 million in Manhattan, or more than twice the $1.6 million average for previously lived-in units, brand-new condominiums can feel out of reach to all but a few. Today’s sluggish market, however, is challenging that assumption. Under pressure, some developers are scrapping their original plans and switching out ultraexpensive units for smaller, less pricey versions. At the same time, neighborhoods where condos were once scarce, like Bushwick in Brooklyn and Rockaway Park in Queens, are now seeing projects with below-average prices. What that means is that many snazzy new market-rate condos can now be had for less than $1 million, although that seven-figure cutoff might seem like an only-in-New-York definition of a deal. Adam America Real Estate is one developer that adjusted an offering plan for one of its Brooklyn buildings as the market turned. In 2015, when Adam America bought a site at 308 North Seventh Street in Williamsburg, the company envisioned a building with 38 apartments, including 15 three-bedrooms, said Tomer Yogev, Adam America’s head of development. 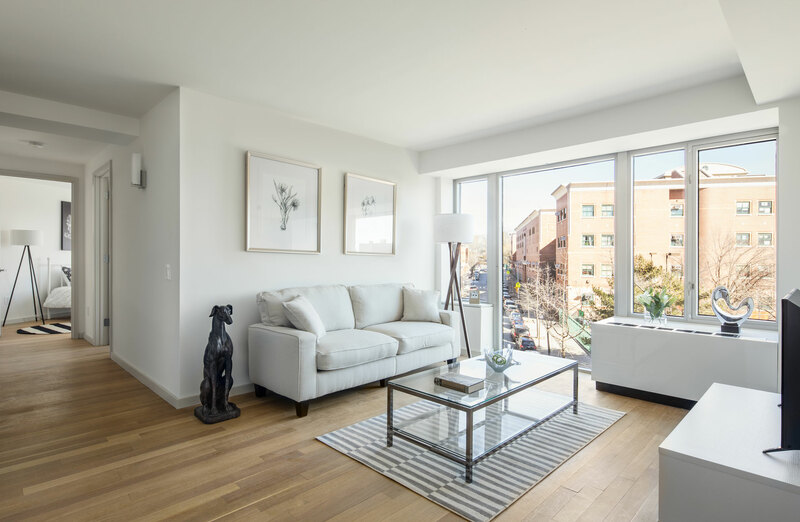 But about a year ago Mr. Yogev noticed that buyers were beginning to shy away from pricier apartments at a different condominium he was marketing in Williamsburg, so he decided to reconfigure the building at North Seventh Street, also known as N7. He eliminated some three-bedrooms, shrank the size of the two-bedrooms and increased the number of one-bedrooms. Today, N7, which is next to the Brooklyn-Queens Expressway, has 45 units: 20 of them one-bedrooms, 20 two-bedrooms and just five three-bedrooms. Most critical, Mr. Yogev said, is that 17 of the apartments, which Douglas Elliman Real Estate began marketing in September, are priced at $1 million or less. “We wanted to let buyers enjoy something in their price range,” he said. In general, Brooklyn seems to be a good place to look for the under-$1 million condo. Last month, Kings County had 197 market-rate condos in that range, according to StreetEasy. About three dozen of those units are in Bushwick, where midsize modernist developments like 267 Evergreen Avenue, an eight-unit condominium from HomeLand Property Group, coexist with shabbier buildings, like the shuttered deli the condo faces. Seven apartments there were listed for under $1 million when the building started sales in August. By last month, half had sold, said Daniel Fried, an Elliman agent who represents the building, where vented stoves, sliding wood balcony doors and distant views of Manhattan are highlights. It also may be a financial Rubicon: New York slaps a one-percent “mansion tax” on transactions over $1 million, and that extra $10,000 or more is a fee many buyers try to avoid. But to stay on the affordable side of that line, they may have to take a chance on a neighborhood where coffee shops, sit-down restaurants and other mainstays of more popular neighborhoods are limited. “It’s happening, but it’s not quite there yet,” said Marty Hanna, a broker at the Bedrock agency, as he gazed out a window at 1370 Bushwick Avenue, a five-story non-doorman building at the corner of Decatur Street from Urban View Development Group. All 10 apartments at No. 1370, which have oak floors and quartz counters, are priced under $1 million; two-bedrooms that went on the market this summer started at $550,000. Three units are in contract. But even prime Brooklyn neighborhoods are not out of the question. Consider Downtown Brooklyn, where Extell Development Company is at work on Brooklyn Point, the condo portion of the City Point mixed-use development on Flatbush. At the 720-foot tower, designed by Kohn Pedersen Fox, 24 of the 458 units are studios, 23 of which are listed for under $1 million. The studios, which average about 550 square feet, start at $850,000. Potentially sweetening any deal, Extell executives said, is the building’s 25-year tax abatement, a rarity after the state’s 421-a affordable housing program did away with abatements for most condos in a 2017 revamp. Under the abatement, buyers at Brooklyn Point will owe no property taxes for two decades, the equivalent of about $11,000 a year in savings for studios. Brooklyn Point, Extell’s first Brooklyn project, has 40,000 square feet of amenities, including a lounge with a wine bar and a wraparound terrace, a 35-foot climbing wall and a rooftop infinity pool that takes in Manhattan’s skyline. Around the corner is a competitor, 11 Hoyt, a pale, cast-concrete spire from Tishman Speyer with 481 apartments. Of them, 116 studios and one-bedrooms are currently priced at $1 million or less, said Erik Rose, a Tishman managing director, although prices could increase soon. Many of those units have unusual bumped-out windows that offer a ledge on which to sit. The apartments also have lava-stone counters and Bosch appliances. “We wanted to bring high design to Brooklyn,” Mr. Rose said. The building also has 55,000 square feet of amenities, including an indoor pool, a squash court, music rehearsal rooms, a test kitchen and an elevated park of more than a half acre. The $3 million to $10 million bracket for condos is hurting across the city, but at this condominium, where units average $1.7 million, or about $1,600 a square foot, “traffic has been exceptional,” Mr. Rose said, although he declined to provide sales statistics. Queens had more than six dozen new condos priced at under $1 million from which to choose in October, according to StreetEasy, with about a third in the vicinity of Long Island City, an area awash in construction near the East River. Although prices have climbed in the once-industrial area, the average in the third quarter was still $1.1 million, according to Elliman, down slightly from the preceding quarter. But values could soon climb, with the anticipated announcement from Amazon that it will open a major new office in the neighborhood. And many of the retailer’s thousands of employees may seek housing in the area. Among projects with numerous under-$1 million apartments is Corte, at 21-30 44th Drive, a glassy 85-unit, eight-story project from a team led by CBSK Ironstate. About a third of the units, studios and one-bedrooms fall in that category, said Kayla Lee, a saleswoman with the brokerage Modern Spaces, which is handling marketing. Unsurprisingly, pockets of value can also be found farther from Manhattan. All the apartments at Elmhurst Terrace, a 138-unit two-towered condo at 45-15 82nd Street, in Elmhurst, Queens, are priced at $1 million or below. The project, in a corner of Queens that is attracting developers, seems to be making a play for the Chinese population in nearby Flushing. Two small, local agencies focused on Chinese-speaking buyers have joined the Corcoran Group to market the 42 apartments currently for sale. Yet the building, which has mostly one- and two-bedrooms, is also drawing buyers priced out of Astoria and Long Island City, said Vivian Kuo, a Corcoran sales agent. Seven units are now in contract at the complex, which began marketing in October. And in Rockaway Park, One Sixteen, a condominium with an eight-story tower and a smattering of townhouses at 133 Beach 116th Street — near the last stop on the A train, and the ocean — is offering all but 12 of its 86 units for less than $1 million. In fact, at $600 a square foot, the development’s prices are far cheaper than those of most condos in Manhattan, where new developments now average $2,600 a square foot, according to the Corcoran Group. And by November, 10 buyers had signed contracts at the building, which is to open next year. Still, with 67 under-$1 million new-development listings available in October, according to StreetEasy, Manhattan is not entirely off limits to entry-level buyers. Those units are often found in Upper Manhattan, where condos are increasingly common. In Central Harlem, for instance, there is the Rennie, an eight-story, 134-unit offering at 2351 Adam Clayton Powell Jr. Boulevard from BRP Companies, listed by Halstead Property Development Marketing. Sixty-eight of the 106 market-rate apartments are less listed for less than $1 million, including all of the studios and one-bedrooms, plus a small penthouse with a private terrace, said Jeff Krantz, an associate broker with Halstead. Buyers priced out of more expensive areas like Chelsea, Hell’s Kitchen and TriBeCa have been sniffing around, Mr. Krantz added. Finishes at the Rennie, which was named for the Renaissance Ballroom and Casino that once stood on the site at West 138th Street, include oak floors, stainless steel appliances and Ecobee smart thermostats, and building amenities include a work lounge, gym and dog spa. The condo is also offering 27 apartments for below-market rates. But as is the case in other developments, those units will be reserved for people with incomes below certain levels and will be awarded through a lottery expected to draw thousands of applicants. Another nearby condo attracting buyers from elsewhere in Manhattan is 70 West 139th Street, a 64-unit condominium with 21 market-rate and 42 affordable apartments (plus a unit for a superintendent) from Parkadon Management and Development. Last month, a south-facing two-bedroom, two-bathroom unit with a small kitchen, a side-by-side washer and dryer, and a balcony lined with synthetic grass was listed at $995,000. “The epicenter of value begins north of Central Park,” said Norman Horowitz, the Halstead agent in charge of sales and, since 2005, an owner of apartment buildings in the area. The under-$1 million segment of the new-development market has been growing. In the third quarter, apartments for less than $1 million made up 16.9 percent of Manhattan’s new-development market, as a share of sales, said Jonathan J. Miller, of the appraisal firm Miller Samuel Inc., up from 11.8 percent in that quarter a year ago. At the same time, the average sale price in the “starter market” — the bottom 10 percent of all transactions, new and existing units, condos and co-ops — hit a record high in the third quarter of $379,000, while bidding wars were erupting over studios, he said. In fact, records have been set for the last five quarters, suggesting that even as interest in lower-priced units has increased, there still aren’t enough to go around, Mr. Miller said. “We have been top-end oriented, but the lack of supply is becoming a very significant factor in the entry level,” he said, noting that steep land and construction costs often make development of these units unfeasible. Buyers shouldn’t expect developers to roll out more studios overnight, said Andrew Gerringer, the managing director of the Marketing Directors, a company that helps get condos off the ground. That’s because slicing large apartments into smaller ones is not easy once construction has started. “It’s always easier to combine units than to take them apart,” Mr. Gerringer said. When Michele Papa, 41, began looking to buy last winter, to upgrade from a two-bedroom rental in Sunnyside, Queens, he assumed that “unless you spend over $1 million, it is probably very, very hard to find new construction,” he said. But he wound up with a two-bedroom, two-bathroom condo at Baldwin Park, a boutique condo in Harlem marketed by CORE Real Estate, for which he paid $945,000. The limited-frills, non-doorman building also has low common charges, about $600 a month, another plus, said Mr. Papa, who moved in last month with his wife, Patricia Cury, 33, and their infant son, Matteo. Soon after, Mr. Papa, a sound engineer, set up a recording studio in his living room, something he thinks would have been difficult to pull off in a co-op.